Visitors to Scottsdale, Arizona can't help falling in love with the scenery, attractions, people and area in its entirety. You have the unique opportunity to enjoy it on a whole new level by staying at the Scottsdale Links Resort. You get the "total package" when it comes to panorama in the Scottsdale area, from the vast desert with its unique and unusual cacti to the palm-lined streets or the stark mountain views. In this part of Arizona, and especially at the Scottsdale Links Resort, whatever the view is, it will take your breath away. No matter what time of year you plan your getaway to Scottsdale, Arizona, you will find as much to do as there is to see. If you can't get enough of the great wide open, there is plenty to do while getting all that fresh air, from hiking the mountain trails and horseback riding, to letting a guide take you off road while you explore and learn about the land and the famous cacti. If you love a good game of golf, you have certainly come to the right place. This nirvana has it all, while being close to a decent sized, neat and clean city. Or, you may want to simply kick back and enjoy the wonderful accommodations. 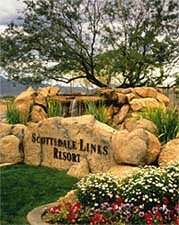 The Scottsdale Links Resort boasts elegantly designed and decorated rooms with secluded patios, balconies or terraces. This provides guests with the ultimate in decadence, convenience and privacy. Take in a massage, relax in the steam room or hit the fitness center, all amid the breathtaking views of the McDowell Mountains. It really is the total package. You already realize how much there is to do around the resort and the city of Scottsdale, as far as outdoor activities. Of course, no trip is complete without a visit to the city for dining, shopping and any other events you may want to take part in. There is, of course, the simple appeal of staying on the grounds and enjoying all there is to do, or relax and not do. You can book some time at the spa, have a cookout in the BBQ area, enjoy the activities department or browse for gifts in our shop. You will be waited on hand and foot, from your massage, concierge and guest services, which even includes dry cleaning. After a day of golf or a vigorous workout at the Scottsdale Links Resort Spa and Fitness Center, relax in the steam room or jetted spa before getting a massage. The fitness facility features only state-of-the-art fitness equipment.